Where you are. This moment in time. And nothing else. 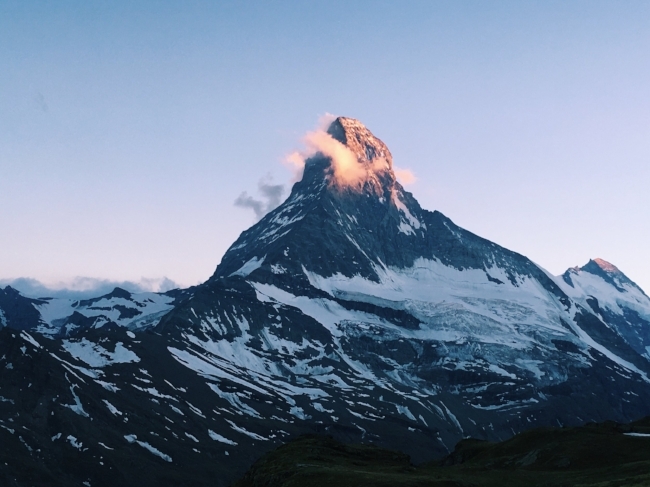 I sit here, ripping off pieces of baguette and pairing them with fresh Gruyere, staring and studying the Matterhorn’s majestic ridges. In close proximity, she captivates an audience. I can’t seem to peel my eyes off the North Face. As though madly in love, I feel every ounce of me being captivated by this mountain. This is why I came here; to the Swiss Alps. To bury myself in this feeling. Everything I’d seen of the Alps up until this moment was gorgeous, but the Matterhorn is most stunning. Up until this moment, I've only seen this persistent cloud that circles the summit in photos. It swirls and dances around the North Face, teasing me with it’s pattern. I’m locked in. I feel privileged to even be in her presence; like I don’t deserve to be sitting across the valley. I didn’t hike for days to get here, only mere hours and a few thousand vertical feet. But I’m here; every piece of me is here. Every thought, every regret, everything held on from the past fades away. Every anticipation, every plan, every question about the future has disappeared. I’m only a body sitting on the grass, in this incredible place. With the sun kissing my skin and the mountains leaving my senses forever tattooed with their presence. Surrounded by beauty, and people I adore... there is no room for anything more. The mountains have taught me how to let a single moment become an all-consuming affair with the present. I’m eternally grateful for that.